3-D Delts: Double Your Workouts For Double The Gains! 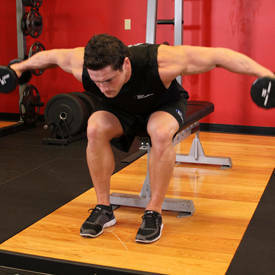 If your shoulders are lagging, your first strategy should be to train them with greater frequency. 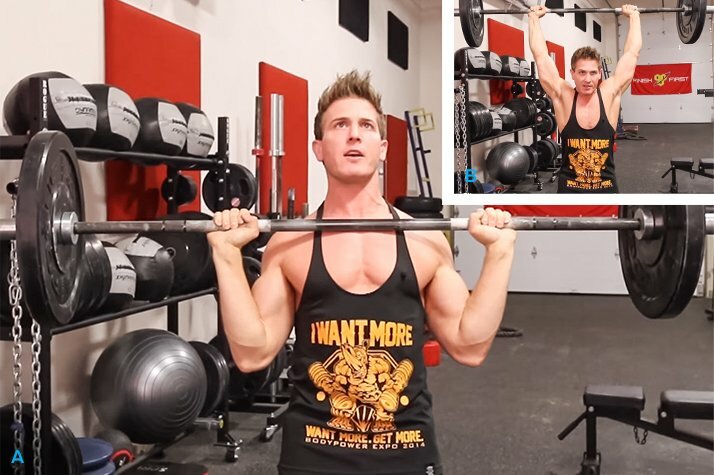 Here's YouTube fitness star Scott Herman's approach for big-time delt gains. Like any body part, your shoulders can lag behind relative to others, especially if you've been neglecting them for more popular muscles like chest and arms. But weak shoulders don't just look funny in the mirror; your shoulders are involved in chest, triceps, and even back training, and there's no way you want your delts to be a limiting factor. The shoulder muscle group is made up of three heads: the anterior (front), middle, and posterior (rear) deltoids. 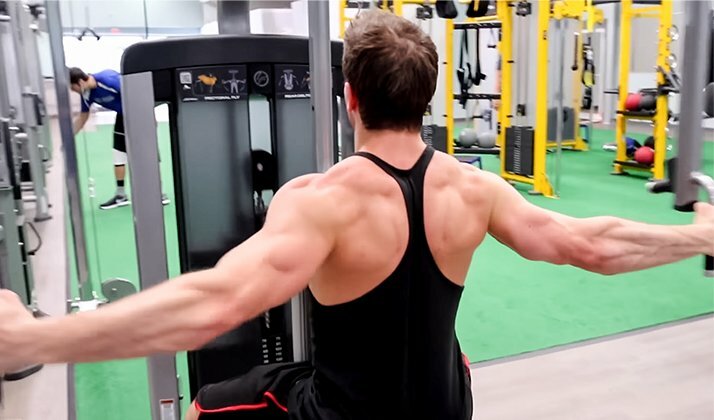 To train your shoulders for maximum growth, your workouts should strategically include exercises that target all three heads through a combination of multijoint and single-joint movements. Before diving into specific workouts, let's look at a few ways you might be inadvertently holding back your overall deltoid growth. Typically, you'll experience a training plateau for three reasons, all of which need to be addressed to get back to building max muscle. When you perform the same shoulder workout (including sets and reps) for more than about two months, your body's adaptation response stalls, resulting in diminishing growth. The best strategy is to make some changes in your workouts when you begin to plateau, and make regular adjustments about every six weeks. When you lift too heavy and utilize momentum to perform shoulder exercises, you're not maximizing muscle-fiber activation because you're inviting other muscle groups into the motion. This takes stimulation off the target body part. Besides maintaining good form, focusing on the movement at hand rather than just going through the motions can help you better feel the movement. Muscles don't grow by training alone. Dialing in your calories and protein intake plays a critical role in growth. In general, you want to eat about 500 calories a day more than you're burning, and you want at least 1 gram per pound of body weight daily spread over several meals. Once you've got the three issues above firmly in your mind, it's time to look at your actual training routine. With the basics out of the way, I'm ready to show you my 3-D approach to building serious shoulders! It may take only 36-48 hours for your delts to fully recover from a workout. If you're waiting a full week to train this body part again, especially if it's lagging, you're missing out on a growth opportunity. This program will help you get back on the road to hypertrophy by boosting the overload, targeting shoulders twice over the course of your seven-day split for a period of six weeks. Rather than simply repeating the same workout, I'm going to break them into two so the stimulus isn't the same. Workout 1 utilizes heavier weights and longer rest periods, while Workout 2 pushes your limits with higher volume and shorter rest periods to ensure every last muscle fiber is exhausted. However, you still want to be careful with how you introduce this twice-a-week shoulder-training program so that it doesn't affect other upper-body muscle groups, and vice-versa. Here's a sample split that allows you to train your shoulders twice a week without impeding on your other workouts. Note that delts are trained after rest days, which mean you should be physically fueled and mentally ready for an incredible training session. If you're currently working with a different split than the one shown here, you can still incorporate this twice-a-week shoulder strategy. Just make sure your shoulder workouts follow a rest day and are never preceded by chest training. This workout focuses on training with heavier weights. After warming up, you'll start your workout by slinging a heavy load for a lower rep target. You'll also be taking a 90-second rest interval between all sets of multijoint moves to ensure more complete recovery (versus Workout 2). 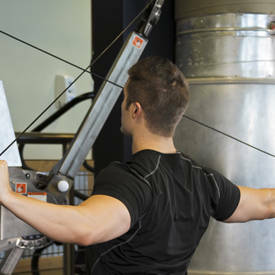 The primary growth mechanism emphasized in this workout is mechanical tension, which is the overall load placed on the muscles, one of the three growth mechanisms (the other two are targeted in Workout 2). The higher overall load simply means you'll be working with weights closer to your one-rep max. Rest 90 seconds between sets of multijoint moves; 60 between single-joint. Do as many warm-up sets as you need, but never take warm-ups to muscle failure. Choose a weight that allows you to reach muscle failure at the target rep.
3 sets of 6 reps; do this movement seated if it's difficult to maintain good form using such a heavy weight. Workout 2 is a high-volume routine (more total sets), including two supersets to ensure you're breaking down every last muscle fiber in your shoulders. The rest periods will be much shorter (30 seconds for single-joint; 60 for multijoint) to really boost the intensity of the workout and your conditioning. The moderate rep targets mean you'll be working with moderate weights. While Workout 1 emphasized heavy weights to spur growth via mechanical tension, this workout instead relies on the other two mechanisms for growth: metabolic stress and muscle damage. Rest 60 seconds between sets of multijoint moves; 30 between single-joint. In a superset, complete both exercises back to back without resting. Then, take your rest interval before repeating for the total number of sets. Twice a Week for Twice the Gains! If you're new to training a muscle group twice over the course of your seven-day split, you should pace yourself for the first couple weeks so that a high degree of muscle soreness doesn't impede the remainder of your workouts. Let your body adapt to the new level of intensity, and then go at it full throttle. If you've been doing the same old shoulder routine for a long while, chances are that all this extra stimulation will drive results!